My Beloved Wife Lei asked me if we have to leave a tip for the staff of Uncle Cheffy restaurant in Nuvali Park. I checked the receipt and I answered “NO”. My reason is that the restaurant already collected a 10% Service Charge. I believe that the service charge is equivalent to tips. We left the restaurant with a shred of doubt. Am I correct in my assumption? Will the restaurant give the collected service charge to the staff? Who the hell invented this culture of tipping which made me so confused and feel awkward? Atty. Persida Acosta of the Public Attorneys Office had the answer in her Manila Times column. According to Atty. Acosta, the collected service charge should be distributed equally to all the restaurant employees. Cooks, waiters, receptionists – all get the same amount. Atty. Acosta also mentioned that the staff only get 85% of the service charge while the management gets the 15%, which is shared to managerial employees. This means that the collection of service charge replaces tipping. So, I shouldn’t feel bad if didn’t leave a tip the last time when we dined in Uncle Cheffy. I agree with her. 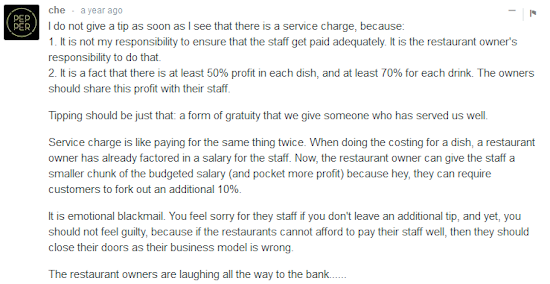 Service charge is making customers unjustly pay more especially that restaurants already factored in salary of their staff when doing their costing for the dish. It is another case of passing the cost to customers like what NAPOCOR and MERALCO are doing. Another unjust reason is that we are obliged to pay the service charge even if the service is terrible. We have no option to opt out since the law is forcing us. Take note that the Philippines has no “tipping culture” despite the fact that we are the most Americanized country in Asia. However, I think that this culture is slowly permeating in our country, especially in the high-income level of our society. Is it reasonable to leave a tip even if the restaurant collects a service charge? The answer depends on you. There are some diners who leave a tip for exceptionally good service. Others will not leave a tip but compliment the waiter and the staff. Both practice are good and I believe charitable. When it comes to tipping, let your conscience guide you. Don’t tip if you feel you’re being forced to give tips. 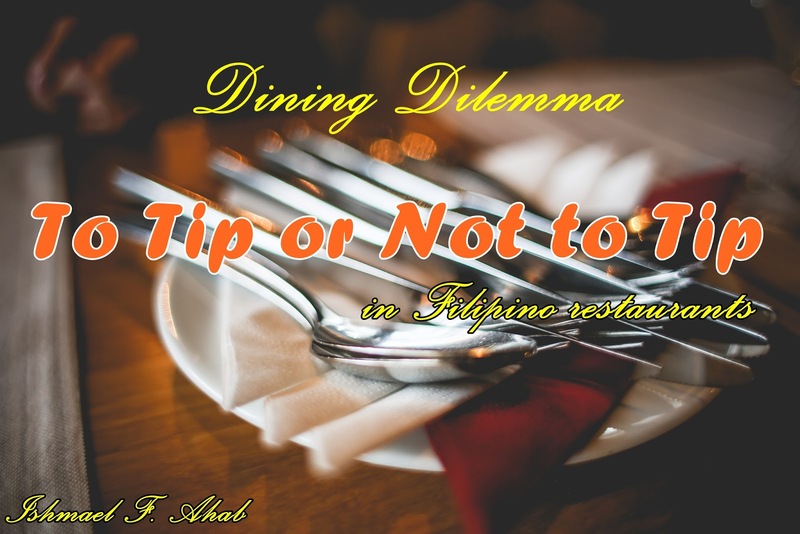 What are your thoughts in giving tips to service staff in Filipino restaurants? Do you still give tips even if there's service charge on your bill? Do you agree on being forced to pay a service charge on top of your bill? Tell me my your thoughts by leaving a comment below. I don't like the service charge idea because some staff doesn't give it their best when they serve you. They're lousy with their jobs and yet you're already paying them for it. But if I love the service, service charge of no service charge, I'm generous with tips. We have the same stand. Service charge is unfair because it makes us extra-pay for lousy services. Restaurant staff who don't do good doesn't deserve the extra-pay. If there is a service charge, then it is expected the service to be good. If not, then it is not justified. Yes, if it is already in the bill, no need to give anymore. Otherwise, the onus is all up to you. I would give whatever change there is if the service is really very good and the food is excellent. Otherwise, I would just take back every single cent. Correct. Good service really deserve a tip. Here where I live for restaurants with air-conditioning, we are also charged 10% service charge in our bills even for bad service. Tsk tsk...that's bad since you are forced to pay the 10% even for the bad service. Whenever there is a service charge, no more tipping unless you really feel that the service was flawless. Since I don't really dine in big restaurants, the smaller restaurants I go in here in Bangkok usually have no service charge, then I do leave a tip. Tama ka. Small restaurants, particularly those at the sidewalks of Bangkok don'rt have service charge. Kaya it is fine to leave a tip. I personally dont give tips on resto because i dont know the rules about it, like, what's the minimum? should i give Php 20.00? or a hundred? But if im totally happy with the servicem i usually let them keep the change. 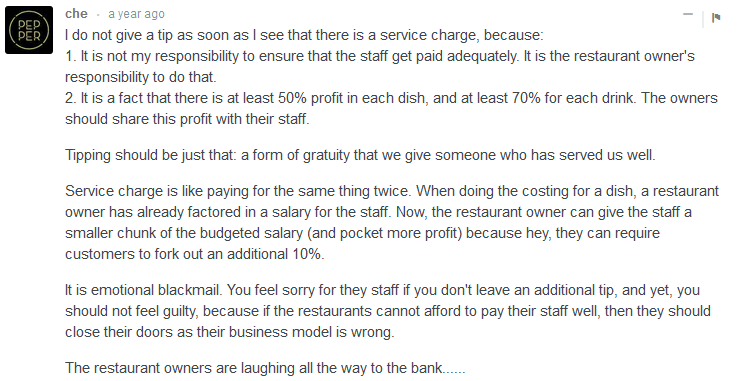 This post made me understand what service charge is all about. So for me, no, but letting them "keep my change" would be a bonus if the service is really awesome. Yes. Dapat talaga bigyan natin ng reward yung awesome service.